The Department of Health and Wellness (DHW) in partnership with Canada Health Infoway has built and is implementing a province-wide Drug Information System in Nova Scotia. The Drug Information System will provide authorized healthcare professionals with access to a comprehensive medication profile for their patients. The Province of Nova Scotia is phasing in the implementation of the Drug Information System over the next few years. 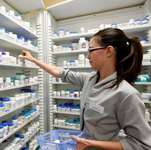 Community pharmacies began connecting to the Drug Information System in the fall of 2013, accessing the system through their pharmacy system. To comply with the Pharmacy Act, all community pharmacies will be required to connect to the Drug Information System by June 30, 2016. Other authorized healthcare providers in the community and in hospital like physicians, nurse practitioners, registered nurses, dentists and optometrists will begin accessing the Drug Information System in the summer of 2015. Depending on their role, authorized healthcare providers will access the system through either the Drug Information System Portal or the SHARE Clinical Portal. In this phase, authorized healthcare providers will be able to view medication profiles and add information to them or update existing information; prescribers will also be able to e-Prescribe. In the spring of 2015, technical specifications for the Drug Information System were completed and made available to the provincially approved and Canada Health Infoway accredited Electronic Medical Record (EMR) software vendors. Software vendors will be required to make modifications to their software for physicians to access the Drug Information System through their EMR. The timing of when physicians will have access to the Drug Information System through their EMR will depend on the timing of the modifications of their EMR vendor’s software. The provincially approved and Canada Health Infoway accredited EMR vendors include Nightingale, Practimax and QHR. Through their EMRs, authorized healthcare providers will be able to view medication profiles and add information to them or update existing information; prescribers will also be able to e-Prescribe. For questions or comments about any of this information, contact dis@novascotia.ca. Important educational materials for dispensary staff (pharmacists, pharmacy technicians and pharmacy assistants) consisting of online e-learning modules and reference documents are available on the Education Materials page. Documents and forms to assist pharmacies with connecting to the Drug Information System and to support ‘Go Live’ can be found on the Getting Connected page. Information regarding technical support once a pharmacy is connected to the Drug Information System is available on the Technical Support page. Communication materials for patients, brochures and bag inserts, can be found on the Communications for Patients page. Documents and forms to assist pharmacies connected to the Drug Information System with getting pharmacists access to patient lab values in the provincial electronic health record system known as SHARE, can be found on the Getting Access to Patient Lab Values page.